Glass is the most contentious medium in art, and has been so since mid-way through the 20th century. Before that there were just as many arguments among glass artists and their audience, but they were tempests in so many blown glass teapots. What happened to change all that was, as could be expected, money. Glass, in particular blown glass, regardless of whether it was respected as art or condemned as craft, produced the highest-priced objects during the years leading up to the boom-and-bust that marked the turn of the millennium, when entirely forgettable works began to bring prices that only rare, old master works had brought before. But in the mid-to-late 90s, a glass maker like the Venetian master Lino Tagliapietra could show a handful of non-functional vases in a gallery at prices totaling over a million dollars. Whether it was art or decor was just one argument this kind of spending engendered. The collapse of the art market after 2008 probably put an end, at least for now, to such debates. A possibly more durable question about glass concerns its precise role in art. If an artist simply reproduces things in glass, is that art? Probably the most widely-known American glassblower is William Morris, who fashions faux Ice Age artifacts from clear glass covered with a thin layer of colored glass. He feels that the way these fetishes gather light in their transparent interiors makes visible the way they manifested spiritual power for their makers. But is that enough to make them art? Then there are the legions of ‘collectors’ paying small fortunes for goblets with stems that depict fruit, fish, and other popular icons. Against these trends, there are artists who work in a mixed variety of mediums, making sculptures or doing installations that use glass for its innate qualities, such as transparency, intense color, and the ability to bend light. While no one questions their claim to be artists who use glass, their work goes ignored in the press that promotes art glass as art, they and their works spurned in the places where glass artists and their audiences meet. Recently, the Kimball in Park City hosted a large exhibition by Einar and Jamex de la Torre (http://artistsofutah.org/15Bytes/index.php/de-la-torre-glass-at-the-kimball/), two brothers from Guadalajara whose large-scale, mixed-media glass sculptures draw contrasts between cultural norms on either side of the US-Mexico border, while generously satirizing both. But what the average Utahan knows about glass begins and ends with Dale Chihuly’s participation in the Salt Lake Olympics, which left behind the two glass pillars in the lobby of Abravanel Hall. So it’s always welcome when a peripatetic glass show comes our way, like the return this weekend of Danielle Blade, bringing new work as part of her latest simultaneous venture into both Park City’s Dancing Hands and Silver Queen Fine Arts Galleries. Beginning with back-to-back receptions this Friday and Saturday (March 29 & 30), the two galleries will separately showcase both her vessels and her sculpture. Along with a chance to challenge preconceptions about what art can be made out of and what it can do, consummate craftsmanship will be on display in works of soul-nourishing, luscious beauty. Aching to bring one home should be expected. Danielle Blade’s vessel work will be on exhibit at The Dancing Hands Gallery, 591 Main St., and Silver Queen Fine Art Gallery, 577 Main St., will exhibit her sculptures. The galleries will host free artist receptions on Friday, March 29, and Saturday, March 30, from 6 to 9 pm. 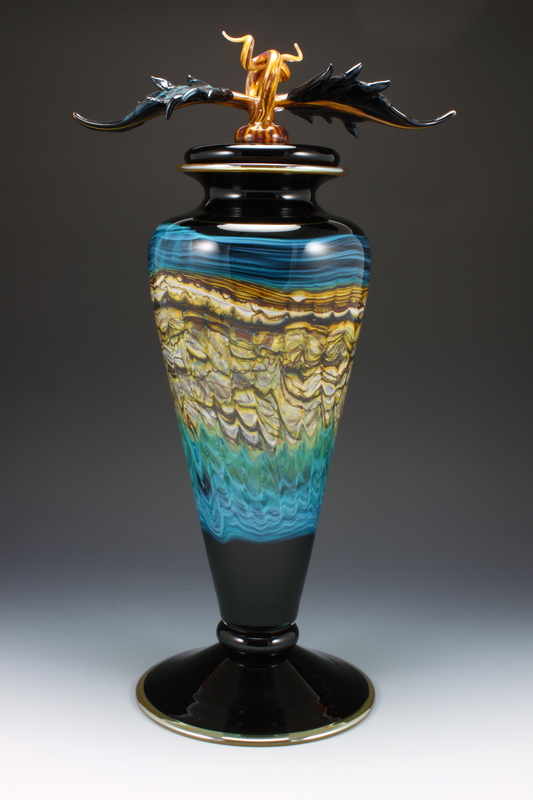 Danielle Blade’s Black Saragossa series of vessels is on exhibit at The Dancing Hands Gallery in Park City.